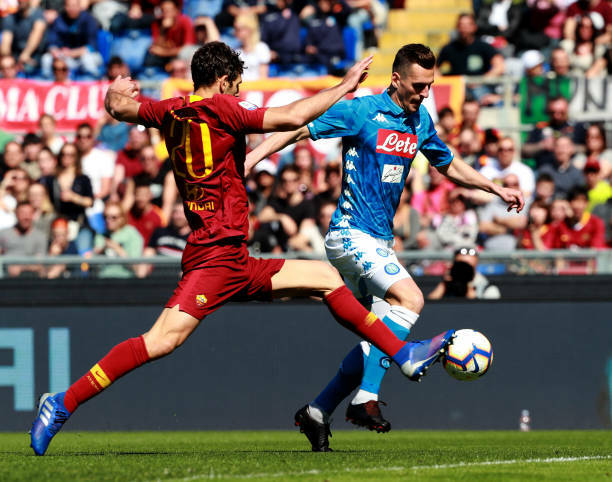 Napoli humiliated Claudio Ranieri's Roma with a 4-1 win in the Stadio Olimpico on Sunday consolidating second place, 15 points behind runaway leaders Juventus in Serie A.
Arkadiusz Milik put the visitors ahead after two minutes with Dries Mertens, Simone Verdi and Amin Younes adding three more in the second half to inflict another blow on the hosts' Champions League ambitions next season. Juventus continued their march towards an eighth consecutive Serie A title with on-form teenager Moise Kean scoring the only goal against Empoli on Saturday. Carlo Ancelotti's Napoli have almost no chance of winning the title with nine games to go, but extended their cushion on third-placed Inter Milan to ten points before Luciano Spalletti's side host Lazio later on Sunday. "I expected a performance like this. In training I had seen the right spirit, the team is growing," said Ancelotti, whose side are building towards a Europa League quarter-final clash against Arsenal. It was a further blow for Ranieri in just his third game in charge since taking over from Eusebio Di Franecesco as the Romans fell to their second consecutive defeat for the first time this season. "Do I regret having accepted Roma? Never. I could never regret training this club," said Ranieri. "It was tough, as Napoli swarm around you, change position constantly and make it very difficult to defend," said Ranieri. 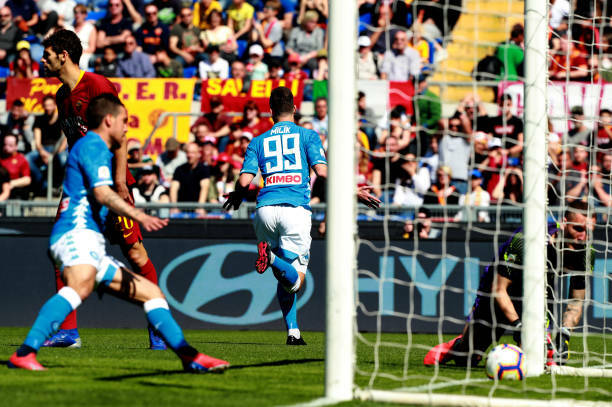 Roma's hopes of qualifying for the Champions League are dwindling and they are in danger of missing out on European football as their sixth position is under threat from Lazio who are two points behind but have a game in hand. Roma failed to take advantage of fourth-placed AC Milan's 1-0 defeat against Sampdoria on Saturday. A win would have moved them within a point of the Champions League places. Instead, Atalanta jumped to fifth with a 3-1 comeback win against Parma. Torino held Fiorentina 1-1 in Tuscany and are two points adrift of the Europa League places.